Tuesday November 13, 2018: Ben learns Wyatt set him up, Ciara tells Tripp the truth about Ben, and Will and Paul move into their new pad. Paul covers his eyes while Will wheels him into their new apartment. When he opens his eyes, he and Will are stunned to see there’s no furniture. Angry, Will makes a call and rails at someone who tells him they can’t deliver for three weeks. Paul grabs the phone and disconnects. He just has to make one call and this will be fixed. Soon, Paul’s friend Rit (played by Rit Mathis), arrives with a truck full of furniture. A while later, everything is placed where the guys want it, and Paul talks about doing a commercial spot for Rit’s family’s furniture store. Will leaves to get some grub. At the square, Tripp worries about Claire’s plan for someone else to take the fall for setting up Ben. Claire says she told Wyatt everything and paid him enough money to turn himself in. At SPD, Hope and Rafe record Wyatt’s confession of setting up Ben Weston for the arson. When questioned as to what type of accelerant was used, he can’t say and lies that it was just something he grabbed off the shelf because he had to protect Ciara. He lets them know the store owner won’t remember him. He was wearing sunglasses and a ball cap. He tells them how he planted the fingerprint and the can of accelerant. Ben leaves Doug’s Place, knowing Doug and Julie won’t give him a job. At a cabin on Smith Island, Abigail and the baby cuddle on the sofa. Chad’s thankful they’re both healthy. He washes some dishes and bounces the baby while an exhausted Abby sleeps. Chad falls asleep and dreams that Gabby’s back and wants her kid. He refuses and she says the child is a gift that gave her the strength to rise up and leave Abby in the shadows. Chad and Abby both wake up when the baby cries. Chad hands over the kid and looks pensive. He goes off to call Stefan. At the DiMera mansion, Stefan wants to call the cops on Gabi for gaslighting Abigail and him but Gabi tells him they’ve the same goal. They want him to be with Abigail. If he spills the beans, Abs will divorce him and remarry Chad. Stefan nods. They argue about what to do and rehash the reason for Gabi’s schemes. Stefan calls this baby a chance at a new family. He won’t put that at risk. He’ll keep her secret and warns her not to cross him. Outside the Brady’s Pub, Sonny is approached by Ben. It’s tense. Sonny’s not happy to see him and Ben apologizes for everything he’s done. He brings up Sonny’s wedding to Paul. He really thought he was doing something good that day by revealing Will was alive. Sonny flashes to saying goodbye to Will and refuses to talk to Ben about his personal life so he’ll feel better. Ben sincerely wants to make amends. “I was sick,” he says, but he’s tired of everyone treating him like poop. Sonny thinks it’s only a matter of time until he is locked up again. Ciara finds Tripp and Claire conspiring. They sum up Hope and Rafe questioning Tripp in the arson case and Ciara blasts Claire for lying about her wanting to help Ben find a job. Claire brushes it off and goes back to work. 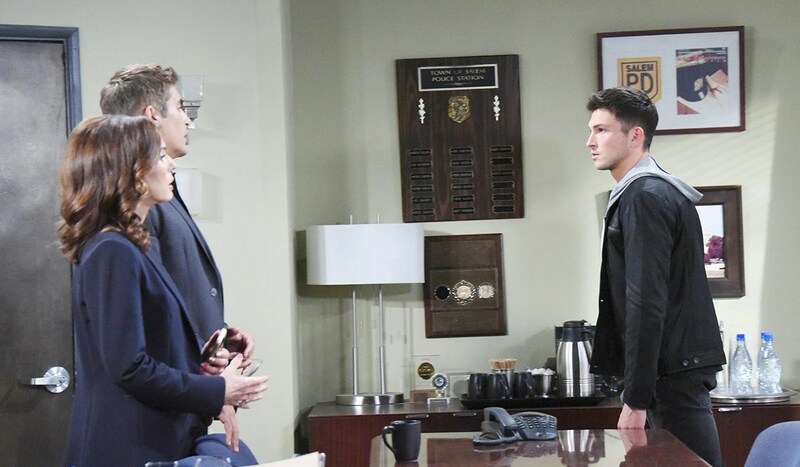 Ben arrives at SPD and Hope and Rafe tell him that Wyatt Stone confessed to setting Ben up. The DA decided not to pre ss charges and Ben snorts, thinking it wasn’t enough. The cops inform him he’s still not off the hook. Ben shakes his head, frustrated. He asks if one of their pro bono lawyers will help him sue the department for harassment. Rafe mocks Ben, saying his heart is bleeding for him. Ben’s free to go and realizes Hope’s apology was a bunch of BS. Back at the loft, Ciara admits to Tripp that Ben revealed he has feelings for her. Will arrives at the pub to get food when he sees Sonny. They smile at one another. Will reveals his love for Sonny for the last time and admits he journals about his feelings. That feels good to Sonny, who agrees those thoughts should stay unspoken. Claire meets Wyatt in the squ are. She pays him off and is glad that it was only a misdemeanor. Claire thanks him. “Anytime,” he says, leaving. Back at Paul’s, he unpacks some stuff and finds Will’s journal.